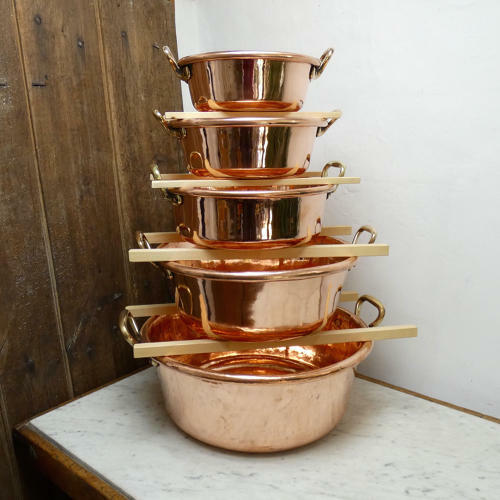 A really good, graduated set of five French copper preserve pans. These pans are well graduated in size from the largest, which is 51cm. wide by 20cm. deep, to the smallest, which is 29cm. wide by 10.5cm. deep. These are the sizes of the pans excluding the handles. Each pan is good quality, being made from a heavy gauge of copper, and they all have matching, ornate, brass handles. They are all generally in very good condition, with just very minor dents and scratches from use. They are a matched set, as they have not always been together but, as a set, they make a very good, decorative display. They all date from c.1860 to 1880. When displayed as a pyramid the overall size is 80cm. high by 58cm. wide by 51cm. deep. Price includes postage within the U.K. Shipping to the U.S.A. add £100. Western Europe add £50.